CNET News.com and ArsTechnica both have information on the next major version of Intel’s Core Duo platform, in regards to naming convention. 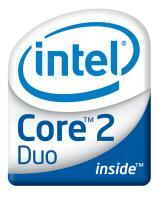 Intel has dubbed it Core 2 Duo or Core 2 Solo. Each Core 2 Duo chip will also have a model number that will indicate how much power it consumes and its relative performance, said Intel spokesman Bill Kircos…..Merom processors will use either the 5000 series or 7000 series numbers, he said. Conveniently, the Conroe numbers match up well with the model numbers used by Advanced Micro Devices on its current generation of dual-core Athlon 64 X2 desktop processors. AMD’s highest-rated Athlon 64 X2 processor as of Friday is the X2 4800+. Kircos declined to comment on whether Intel chose the new scheme to line up with AMD’s model numbers. This branding change makes plenty of sense, given the fact that Core 2 (aka Merom/Conroe) represents a significant advance over Core (aka Yonah). It also makes sense in light of the recent news that Intel will be introducing a new microarchitecture every two years. Personally, I almost would have preferred Core Duo 2 or Core Solo 2, but either way there could be some confusion, and perhaps at some point the “Duo” and “Solo” monikers will be dropped, as they may go to a standard number of CPU cores, or they may move to Core Quad and Core Duo or whatever. This entry was posted in Announcements, Articles, Intel. Bookmark the permalink.